The primary difference between arbitration and conciliation is that arbitration is the process by which parties select an independent person, who renders a decision regarding the case. Conversely, conciliation attempts to make parties come to an agreement, about the problem at hand. Industrial Disputes are always harmful to all stakeholders – employees, society, management, government, etc. resulting in loss of revenue, production, profit and much more. However, it is the employees who are worst affected by the industrial disputes, as the consequences would be a lockout which may lead to loss of wages and even jobs. Industries are the backbone of the economy, and if the strife may continue for long, the whole economy may collapse. So, the settlement of industrial disputes should be done as soon as possible. Arbitration and Conciliation are two such methods of resolving industrial disputes out of the court. 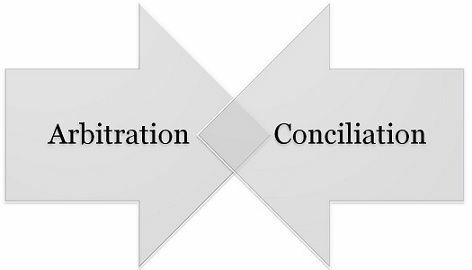 So, take a look at the article to understand the differences between arbitration and conciliation. Meaning Arbitration is a dispute settlement process in which a impartial third party is appointed to study the dispute and hear both the party to arrive at a decision binding on both the parties. Conciliation is a method of resolving dispute, wherein an independent person helps the parties to arrive at negotiated settlement. Enforcement An arbitrator has the power to enforce his decision. A conciliator do not have the power to enforce his decision. Available for Existing and future disputes. Existing disputes. Arbitration is a powerful means of resolving disputes between the organisation and its employees. It is a process in which an independent third party analyses the bargaining situation, listens to both parties and collects necessary data and make recommendations which are binding on the parties concerned. Arbitration is proved successful in resolving disputes between labour and management. The parties themselves establish arbitration and decision is acceptable to them. The decision taken by the arbitrator is accompanied by a written opinion providing reasons supporting the decision. Further, the procedure is comparatively expeditious than courts and tribunals. However, the process is a bit expensive, and if there is a mistake in selecting an arbitrator, the judgement becomes arbitrary. The process wherein the representative of both employer and employees are brought together in front of a third party so as to persuade them to arrive at a decision by agreement between them. Any party can request the other, for appointing the conciliation officer. The conciliation officer or conciliator can be an individual or a group of people. There will be no conciliation if anyone of the two parties rejects the offer to conciliate. The primary duty of the conciliator is to mediate in and advocate settlement of industrial disputes. Further, he/she is also responsible for holding conciliatory proceedings, investigating disputes, sending the report of settlement to AG (Appropriate Government). Arbitration refers to a method of resolving industrial disputes, wherein the management and the labour present their respective positions to the neutral third party, who takes a decision and imposes it. Conciliation is a method of resolving the dispute, wherein an independent person, who meet the parties jointly and severally and helps them to arrive at negotiated settlement or resolve their differences. The decision made by the arbitrator is acceptable to the parties concerned. On the other hand, the conciliator does not have the right to enforce his decision. Arbitration requires a prior agreement between parties known as arbitration agreement, which must be in writing. As against this, the process of conciliation doesn’t require any prior agreement. Arbitration is available for the current and future disputes whereas the conciliation can be adopted for existing disputes only. Arbitration is like a courtroom proceeding, wherein witnesses, evidence, cross-examination, transcripts and legal counsel are used. On the contrary, Conciliation is an informal way of resolving disputes between the management and labour. Industrial disputes are nothing but the differences and conflicts between the employer and employees of the organisation. It can arise because of unfair labour practices, wage demand, political interference, labour laws and so on. The methods discussed above are alternative dispute resolution, undertaken with the view to agreeably and peacefully settling the disputes, out of court. You can choose any of these two methods, as per your choice and requirements.